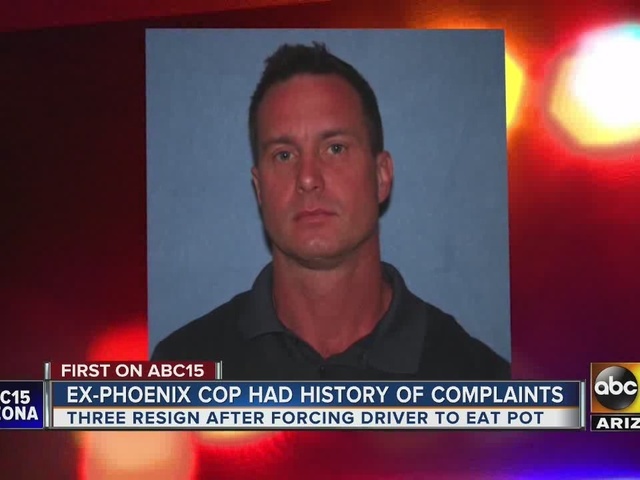 Three Phoenix police officers have resigned and a fourth has been demoted in connection with a complaint filed by a man accusing them of inappropriate conduct during a traffic stop. The incident happened Tuesday night when the man was pulled over for speeding. Sources say there was a gun and a small amount of marijuana in the car when the man was stopped. He claims to have a medical marijuana card, but sources within the department say there is no documentation of that. The man was cited and released. 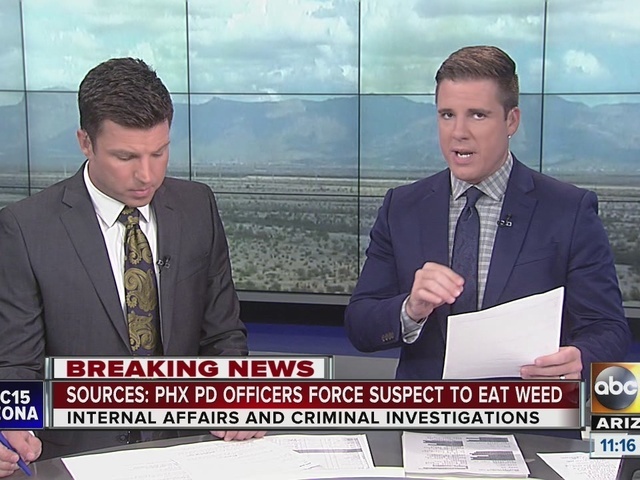 A spokesman with the department tells us after the traffic stop was concluded, three of the officers did not know what to do with the small amount of marijuana, so they forced the man to eat the drugs. He got sick and filed a complaint with the department. 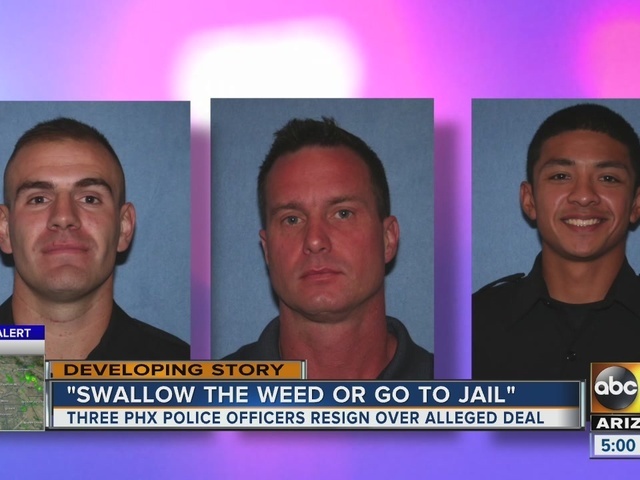 Thursday afternoon, Phoenix Police Chief Joe Yahner said the three officers involved had chosen to resign, rather than be fired. The person who was demoted was a recently-promoted patrol lieutenant who did not immediately take action after the complaint was filed. The three officers were identified as Richard G. Pina, Jason E. McFadden and Michael J. Carnicle. All were still in their probationary period with the department, which lasts through their first year. The officer demoted from lieutenant to sergeant was identified as Jeff Farrior. Police released photos of Pina, McFadden and Carnicle, but said Farrior's was protected by a court order and unable to be released. McFadden came to the department as a transfer from the Chicago Police Department and worked narcotics cases for several years. Sources tell us he was one of the major offenders. When reached Thursday, Chicago police said McFadden resigned in 2016 but could not provide any other information without filing a formal request under the Freedom of Information Act. Yahner said the three who resigned would have been fired had they not voluntarily left the department. Internal affairs and criminal investigations are currently underway, officials said. All officers involved were wearing body cameras at the time of the incident, but they were turned off, Chief Yahner said. The Phoenix Police Department was recently made aware of an incident involving alleged misconduct by several of our officers. The incident is currently under both criminal and internal investigation. The allegations against these officers are disturbing and upsetting. The allegations were brought to our attention by a 19 year old male who lives in Phoenix. He reported that several officers stopped him for a traffic violation around 3:30 a.m. on Tuesday, September 13 near 4500 West McDowell Road. The officers are reported to have found marijuana in his vehicle during the stop. 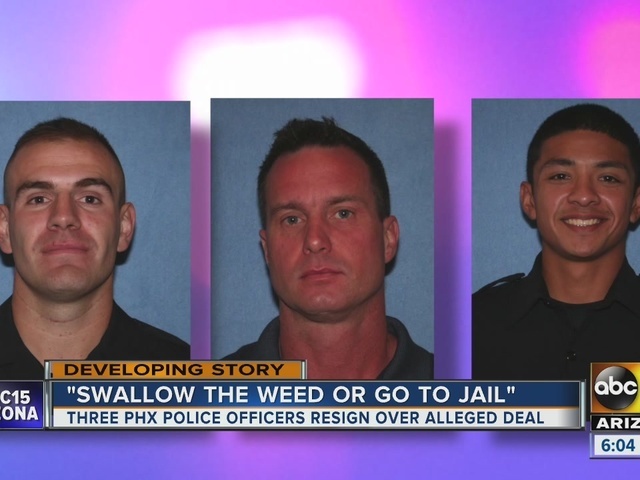 Upon the discovery, the officers demanded he eat the marijuana to avoid being taken to jail. The resident reported that he ate the marijuana, was issued traffic tickets and then released from the scene. The Phoenix Police Department has a strong history of holding officers accountable for their actions, and this includes seeking criminal charges whenever appropriate. Two officers have been identified as possible suspects in the criminal investigation. As the investigations proceed, I will continue to share information as allowed by law. As your Police Chief, I want you to know how appalled I was when I was informed about these allegations. The conduct alleged by our resident is contrary to everything we stand for as community servants. I have directed our criminal and internal investigators to make their inquiries thorough and swift. Once the facts are determined, I will take quick and appropriate action to ensure those involved are held accountable for their actions. The criminal and internal affairs investigations into what happened remained ongoing, according to Chief Yahner.